Looking out my kitchen window, I watched as the Mercury station wagon pulled into our driveway. It was the same every time Brian’s parents came to visit. His seventy-five year old dad, Paul, would carefully step out of the car, walk around to his wife's door, open it and help her out. Slowly she would emerge, take his arm and walk slowly into our house. After getting her safely into the kitchen, Paul would return to his car to retrieve his box of whatever it was he brought to share with us. Some days the box contained large round golden melons, the kind that just melt in your mouth with a sweetness not found anywhere but straight from the garden. Being a summer joy, we’d eat them for breakfast everyday for weeks. Other times the box was overflowing with large fresh brown Grundy County potatoes, dug from the black dirt mounds in his garden. He didn’t mind getting his hands dirty. He loved the earth and he had us in mind as he planted and harvested. Years ago he had a contest to see which of our kids could dig up the biggest potato. Our student from Ukraine, Olah, won the prize, a full fifty cents. From the large grove of apple trees growing on the farm’s western property line, he would bring apples so we could make applesauce and preserve it for winter eating - while they were in Arizona, feasting on fresh oranges and grapefruit. He loved to give apples away, many neighbors benefitted yearly from his generosity. For many years, I looked forward to these seasonal boxes of edible treasures. The food was always fresh, usually picked the day he delivered them, and we put every bit to good use. But the box I most looked forward to was the one overflowing with his home-grown butternut squash. My eyes would light up at their oh-so-golden bulbous pale skin with their hidden dark orange flesh, gigantic, and filled with a promise to be delicious. He’d bring them in, set the box on the back porch and remark with a little grin, “These should last a while." And last a while they did! We ate those squash all winter long! Paul’s generosity was subtle. He gave quietly, without fanfare. Being one extremely careful with his money, he was extravagant when it came to his produce. These he planted to give away. Proverbs 11:25 says, A generous person will prosper; whoever refreshes others will be refreshed. During these holidays I encourage each of us to find ways to be generous, to freely give away what we’ve been given to give. We could give of our time to visit someone sick or lonely. We could get on our knees and pray for the many needs around us. Taking a meal to a grieving or sick friend would be appreciated. Writing notes of encouragement to people who tirelessly serve is another way to be generous. God's Spirit could lead us to give away money. There must be a million ways we could be quietly generous. There are blessings ready… joy filled and satisfying…humbly offered from love deliberately planted to give. 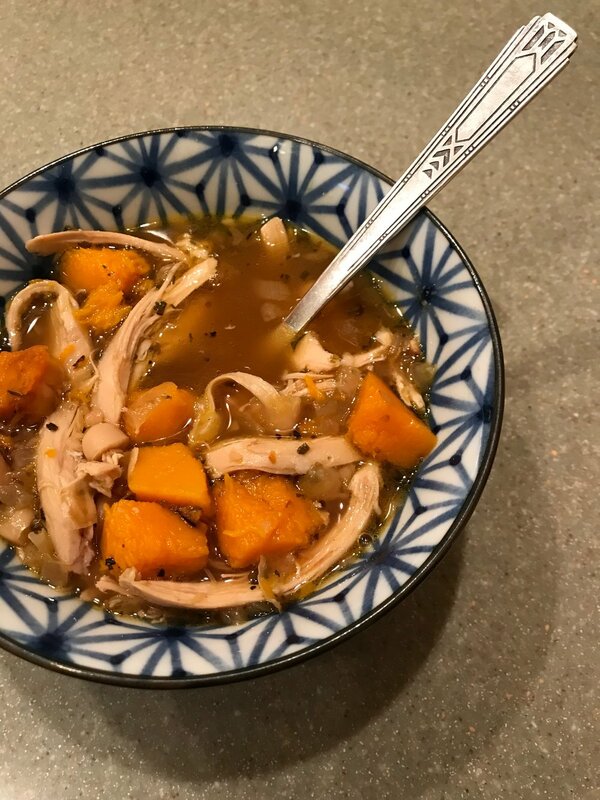 In honor of my father-in-law and the generous sharing of his beautiful butternut squash, here is a new soup recipe that we prepared and enjoyed this past week. 1. Heat a large Dutch oven over med-high heat. Add 2 Tbsp oil to pan; swirl to coat. Add squash, saute’ 8 minutes or until lightly browned on all sides. Remove squash from pan; set aside. 2. Add remaining 1 Tbsp oil to the pan. Add 5 tsp garlic, onion and next 5 ingredients (through red pepper) to pan; saute’ 6 minutes or until vegetables are tender. Add stock; bring to a boil, scraping pan to loosen browned bits. Reduce heat to medium, and simmer, uncovered, 10 minutes. 3. Place 1 cup beans in a small bowl; mash with fork. Add missed beans, remaining 1 cup beans, and reserved squash to pan. Cook 3 minutes. Stir in chicken; cook 2 minutes or until thoroughly heated. 4. Combine remaining 1 tsp garlic, cilantro, and lime rind in a small bowl. Top each serving with about 1 tsp cilantro mixture.